Okay, so my kitchen literally has four cabinets. Four. One is for baking stuff, two are for dishes, and one is too high for me to reach…so it stores holiday dishes and dust bunnies. Therefore, I have to store my food in a separate storage unit…some ugly wire thing I got on sale from Target. Granted it does a great job holding my food, but I didn’t like that everything inside was visible. I didn’t want to have to worry about buying a certain brand of pasta sauce because it matched my color scheme (don’t judge!) and I didn’t like that everyone could see what I kept in my pantry. So, it was off to the craft store I went to pick up some fabric and see what a little 7th grade level sewing would do for me. Here’s the result. 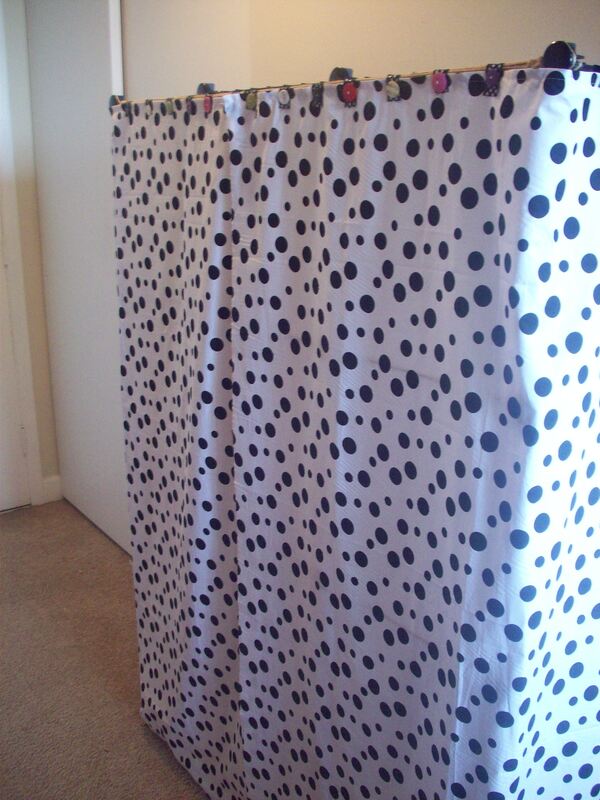 An adorable polka dot fabric attached with buttons. I seriously used stuff around my house to make this and the only thing I had to buy was the fabric…and I can almost guarantee that you have some of this stuff on hand, too. So do you have a pantry, TV, computer, workstation, or gun rack you want to cover up when necessary? Here’s the super easy non-Martha Stewart-way to get it done. –Depending on the unit, you’ll need something to hold the curtains up. Since my unit did not lend itself to using a pole or curtain hangers, I used heavy duty string and wrapped it from one end to the other about 10 times. You can use utility string, wire, or if you can use a pole, go for it. –At least 2-4 yards of fabric. Measure around the unit to see how much you need. First thing’s first…clean out your unit. You’re going to have to move it around and it’s much easier when nothing is inside. Attach whatever you’re going to use to hold the curtain to your unit. Like I said, I used heavy duty string and it worked perfectly. Otherwise you can use a dowel rod or you could attach the curtains right to the unit if it will allow the curtains to slide. If you’re not worried about having the curtains slide or can easily sweep the curtains to the side to get to what’s underneath, you can simply attach the curtains to the unit itself. I only attached the string to the front of the unit, since that’s the part I’m using. If you’d like, you can wrap the string around the entire thing. 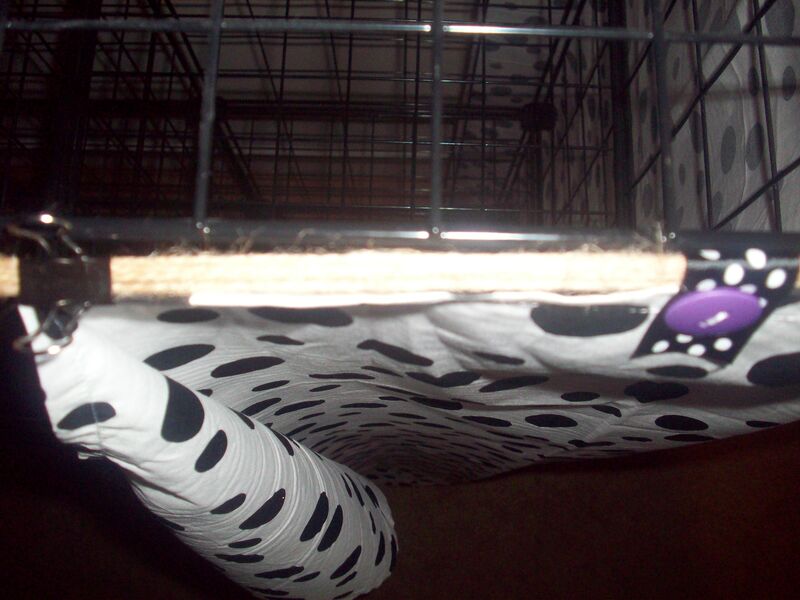 For easier stability and to help hold the curtain up, I attached the fabric directly to the unit on the sides and back…so only the front is moveable. Prep your ribbon by cutting it into 2-3 inch strips. 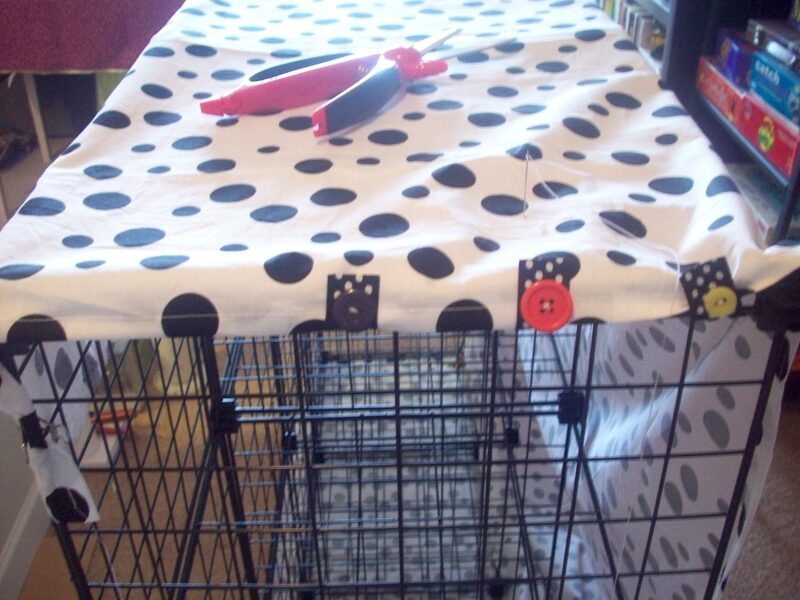 Using the metal paper clips, clip the fabric to the unit to help hold it up. Every 2 inches or so, wrap the ribbon around the unit and secure it to the fabric by sewing a button on the two ends of the ribbon and the fabric so it makes a kind of sandwich (back of ribbon, fabric, front of ribbon, button). Continue on the side until you get to the front. Repeat the same pattern on the front but instead of wrapping the ribbon around the unit, wrap it around the string so the curtain will be able to slide. If you’d like, you can secure the bottom of the curtain to the unit by doing the same thing you did on the sides to the bottom, leaving the front free. I did this on mine but it’s not necessary. If you’re not into sewing, don’t sweat. A hot glue gun will do wonders. 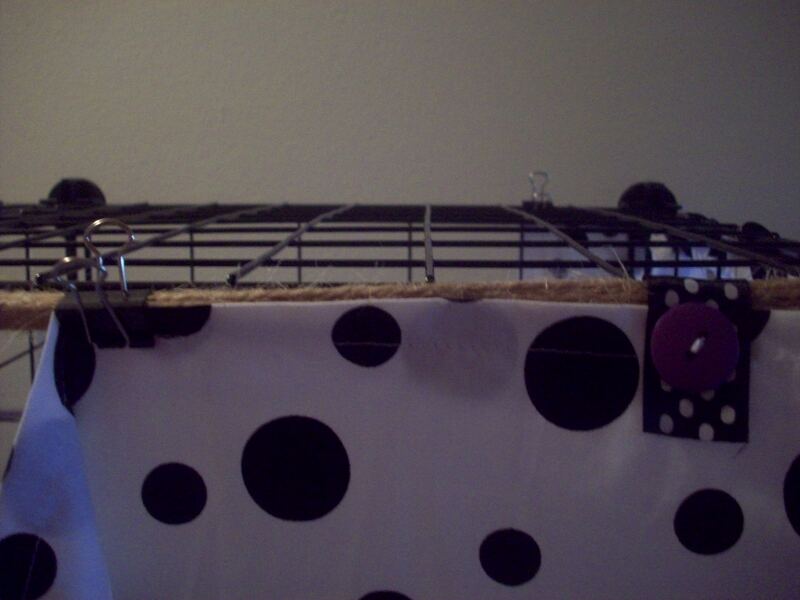 Use the metal clips to hold the fabric up and glue the ribbon to the backside of the fabric first. 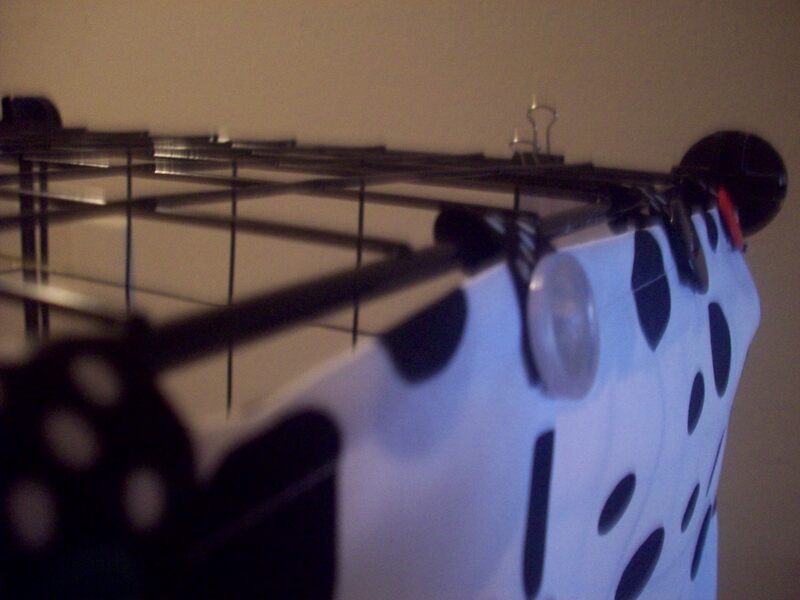 Wrap it around the unit/string and glue it to the front…then simply glue on a button. Easy as pie.